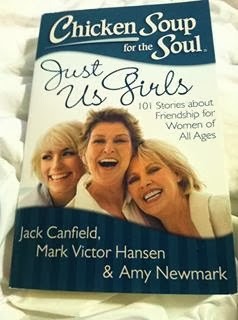 We love receiving Chicken Soup for the Soul books for review. They are small enough for me to drop into my purse, and the stories are short enough that I can read one while waiting for my kids to get out of school! Just Us Girls is a collection of stories for girlfriends. The stories are all about friendship, and I think it is the perfect gift for any friend in someone's life! 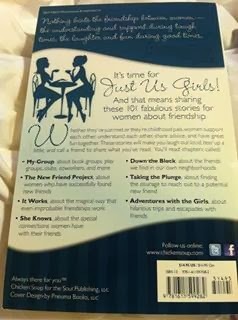 I especially loved the stories about adventures and special events with girlfriends! When my mother was dying, my best friend just came over, got my dad's credit card, went to the grocery store, and came back to prepare all of this food for everyone that she had purchased. She made noodles from scratch. This gave me the chance to spend that special time with my mom. I didn't have to ask. She just knew where I needed her help the most. I have great memories of walking to the drugstore with my best friend. We thought we were so cool for going to the store by ourselves! My best friend is amazing! Our bond is even strong than the bond she has with her twin sister. My best friend had a major crush on my Uncle when we were in high school. We were to leave on a school trip on Good Friday and my dear Uncle was killed in a car accident that morning. My family convinced me to go on my trip as planned since there was nothing that I could do and my Uncle, who was only a couple years older than me, would want me to go. My best friend and I shared each other's grief and helped each other through a hard lesson for a 16 year old to learn-losing someone you love. When we got into a car accident in college.